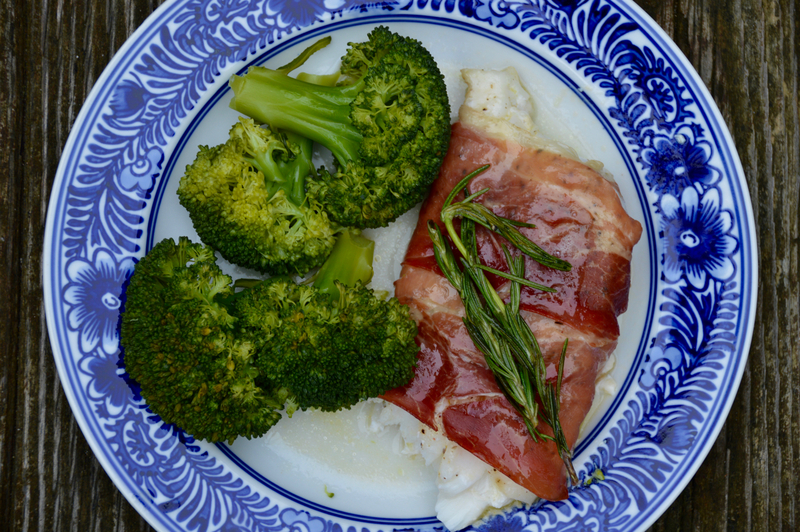 Salty prosciutto, flakey wild-caught cod, fresh lemon juice and fresh rosemary sprigs come together to make this Prosciutto Wrapped Cod an absolutely irresistible and easy dish to make. If you're bored with the usual baked fish with breadcrumbs and butter recipe (like me), this is just what you need! I'm always seeing things wrapped in bacon, which is quite similar to prosciutto - call it the bacon of Italy? - yet it doesn't leave you feeling like you just ate a pound of bacon grease. I've been on a real protein kick lately too, trying to cut out ALL the bad stuff and just focus on clean foods with real nutrients. Cod is a perfect example of that. Low in calories, high in protein and easily found in stores as wild-caught and not farmed. It's a light, easy meal to make that makes my food tracker oh so happy. The lemon rosemary sauce is a savory, buttery sauce, and when you make it, you'll find that there will be more than you need. Just be sure to only do one spoonful of it on each fish filet when you serve it. The fish will already have a buttery taste to it from the prosciutto, so what you're really wanting is a light, delicate flavor of lemon and rosemary instead. You can also spoon a little of the sauce over steamed broccoli or brown rice too! For living on Cape Cod and always trying to come up with new ways to cook fresh fish, this one is definitely a winner! 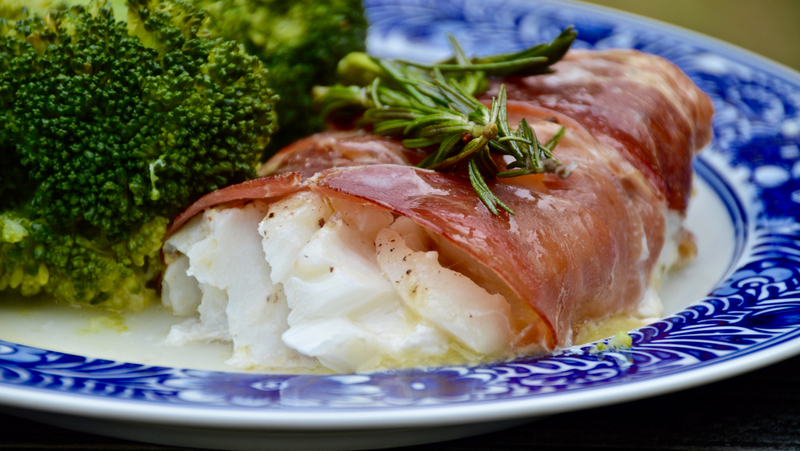 If you don't have cod, you can also try this with striped bass, sea bass, halibut and haddock. On a baking sheet lined with foil, brush each side of the filet with a little olive oil, then sprinkle with salt and pepper. Wrap the fish in the prosciutto slices, leaving the ends open. Bake the fish for about 15 minutes, or until the fish is cooked through. In a small saucepan, melt the butter over low heat with the rosemary sprigs. Once the butter has melted, turn off the heat and stir in the lemon juice. Stir to combine everything, then spoon one spoonful of sauce over each filet serving.